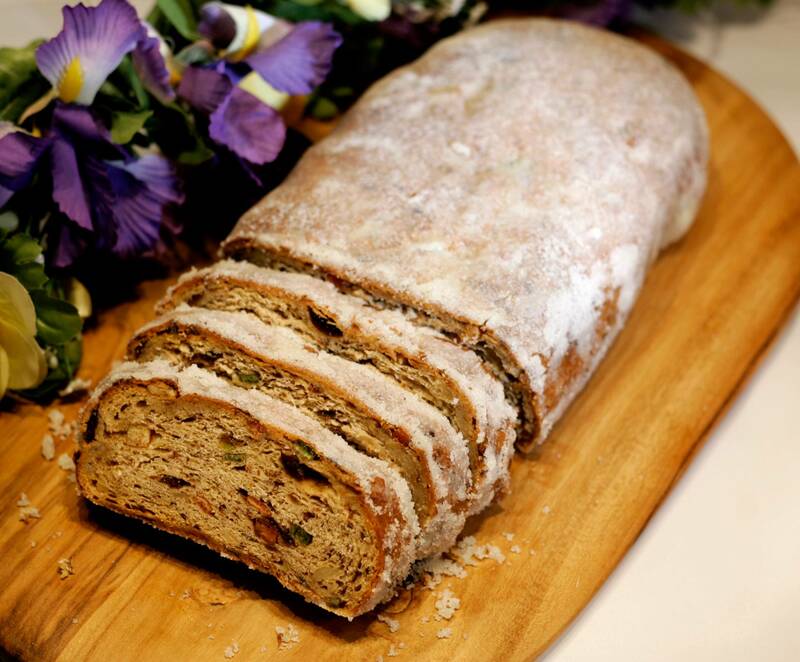 European Stollen is our top-selling Christmas item. Candied fruits, rum soaked raisins, and almonds are folded into the sweet dough. Each Stollen is baked until golden brown, brushed with drawn butter and dusted with sugar for a festive finish. 3 weeks when unopened and stored properly. This is a 1.5 Lb. Stollen. European Stollen is our top-selling Christmas item. We make the special sweet dough from scratch, then fold in candied fruits and raisins (that we soak in Myers Rum for three days) and almonds. Each Stollen is baked to a golden brown, brushed with drawn butter, and dusted with sugar for a festive finish. Heat this delicious bread in the oven for a warm morning treat, or enjoy anytime with coffee, tea, and good friends. Our Stollen are shipped anywhere in the USA and make a wonderful holiday gift.